All good things must come to an end. Bugatti is ending its great 10 year run of the Veyron, with the last of this model ever to be made, the La Finale. The last ever Veyron pays tribute to the first Veyrons ever made with an inverse color scheme focusing on darker shades of red and black. This vehicle is truly one of a kind with only one car having been made, so the rest of us will just have to dream about owning it. The La Finale may be the last Veyron ever to be made, but Bugatti still decided to try out some new things with it. 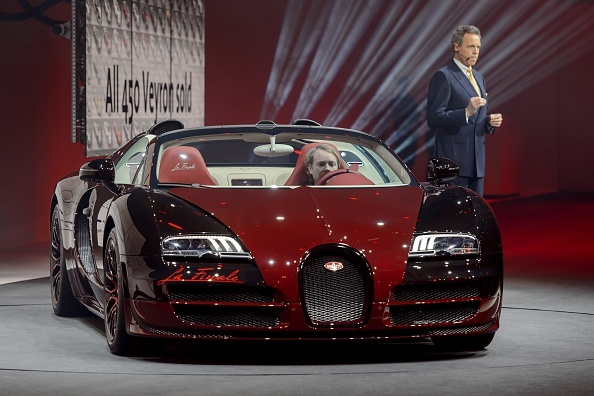 The Veyron La Finale features red carbon fiber, which has never been used on another Bugatti vehicle. It is also the first time that a Veyron has featured black painted air scoops as well as the intercooler cover. Unfortunately, this was both the first and last time a car like this was made. The only La Finale has already been sold to an anonymous customer in the Middle East. The owner was nice enough to let his car be displayed at the 2015 Geneva Motor Show and it is likely the only time the general public will be able to check it out. The price of the La Finale is unknown, but it was likely sold for more than $3 million! The La Finale is the 450th example of a Bugatti Veyron to be produced. The Veyron line debuted in 2005 and the Super Sport version holds the Guinness World Record for fastest street legal production car in the world, with a top speed of 267.9 miles per hour. The Veyron Grand Sport Vitesse holds the record as the fastest roadster in the world, with a top speed of 254 mph. The Bugatti Veyron was also named Car of the Decade for the 2000s by Top Gear, which is a big honor. Back in 2005, the first Veyron models had 985 horsepower. The La Finale has been charged up to 1,200 horsepower from its quad turbo W16 engine. It has a top speed of 268 mph, with a 0 to 60 mph time of 2.5 seconds. The Bugatti Veyron's finale features a detachable roof and a full carbon fiber body. The moniker "La Finale" is featured throughout the vehicle as is the famous Bugatti elephant. The cabin is almost totally upholstered in a silk beige leather for comfort as well as performance. Bugatti is already developing a new supercar to succeed the Veyron and it is likely to deliver almost 1,500 horsepower! You know this new line is going to be amazing if it replaces a car as popular as the Veyron. The owner had better be careful, because there is no replacing the La Finale if something were to go wrong. You could say that the Mansory Vivere adds even more luxury to the already luxurious Bugatti Veyron.